(Nanowerk News) The first published scientific results from the world's most powerful hard X-ray laser, located at the Department of Energy's SLAC National Accelerator Laboratory, show its unique ability to control the behaviors of individual electrons within simple atoms and molecules by stripping them away, one by one—in some cases creating hollow atoms. These early results—one published today, the other last week—describe in great detail how the Linac Coherent Light Source's intense pulses of X-ray light change the very atoms and molecules they are designed to image. Controlling those changes will be critical to achieving the atomic-scale images of biological molecules and movies of chemical processes that the LCLS is designed to produce. In a report published in the July 1 issue of Nature, a team led by Argonne National Laboratory physicist Linda Young describes how they were able to tune LCLS pulses to selectively strip electrons, one by one, from atoms of neon gas. By varying the photon energies of the pulses, they could do it from the outside in or—a more difficult task—from the inside out, creating so-called "hollow atoms." "Until very recently, few believed that a free-electron X-ray laser was even possible in principle, let alone capable of being used with this precision," said William Brinkman, director of DOE's Office of Science. "That's what makes these results so exciting." Young, who led the first experiments in October with collaborators from SLAC and five other institutions, said, "No one has ever had access to X-rays of this intensity, so the way in which ultra-intense X-rays interact with matter was completely unknown. It was important to establish these basic interaction mechanisms." SLAC's Joachim Stöhr, director of the LCLS, said, "When we thought of the first experiments with LCLS ten years ago, we envisioned that the LCLS beam may actually be powerful enough to create hollow atoms, but at that time it was only a dream. The dream has now become reality." In another report, published June 22 in Physical Review Letters, a team led by physicist Nora Berrah of Western Michigan University—the third group to conduct experiments at the LCLS—describes the first experiments on molecules. Her group also created hollow atoms, in this case within molecules of nitrogen gas, and found surprising differences in the way short and long laser pulses of exactly the same energies stripped and damaged the nitrogen molecules. "We just introduced molecules into the chamber and looked at what was coming out there, and we found surprising new science," said Matthias Hoener, a postdoctoral researcher in Berrah's group at WMU and visiting scientist at Lawrence Berkeley National Laboratory who was first author of the paper. "Now we know that by reducing the pulse length, the interaction with the molecule becomes less violent. " While the first experiments were designed to see what the LCLS can do and how its ultra-fast, ultra-bright pulses interact with atoms and molecules, they also pave the way for more complex experiments to come. Its unique capabilities make the LCLS a powerful tool for research in a wide range of fields, including physics, chemistry, biology, materials and energy sciences. The LCLS forms images by scattering X-ray light off an atom, molecule or larger sample of material. Yet when the LCLS X-rays are tightly focused by mirrors, each powerful laser pulse destroys any sample it hits. Since certain types of damage, like the melting of a solid, are not instantaneous and only develop with time, the trick is to minimize the damage during the pulse itself and record the X-ray snapshot with a camera before the sample disintegrates. Both teams found that the shorter the laser pulse, the fewer electrons are stripped away from the atom or molecule and the less damage is done. And both delved into the detailed mechanisms behind that damage. 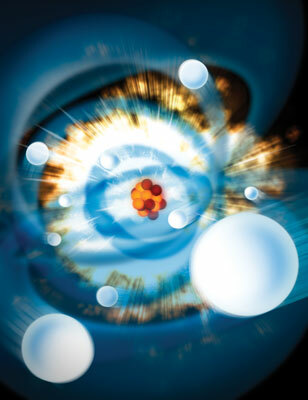 Atoms are a little like miniature solar systems, with their electrons orbiting at various distances from the nucleus in a sort of quantum fuzz. To make things simpler, scientists describe the electrons as orbiting in "shells" at specific distances from the nucleus. The innermost shell contains up to two electrons, the next one up to eight, the third one up to 18, and so on. Since they're closest to the positively charged nucleus, the two innermost electrons are generally the hardest to wrest away. But they also most readily absorb photons of X-ray light, and so are the most vulnerable to getting stripped away by intense X-rays. Although previous experiments with intense optical lasers had stripped neon atoms of most of their electrons, Young's was the first to discover how ultra-intense X-ray lasers do this. At low photon energies, the outer electrons are removed, leaving the inner electrons untouched. However, at higher photon energies, the inner electrons are the first to be ejected; then the outer electrons cascade into the empty inner core, only to be kicked out by later parts of the same X-ray pulse. Even within the span of a single pulse there may be times when both inner electrons are missing, creating a hollow atom that is transparent to X-rays, Young said. "This transparency associated with hollow atoms could be a useful property for future imaging experiments, because it decreases the fraction of photons doing damage and allows a higher percentage of photons to scatter off the atom and create the image," Young said. She said application of this phenomenon will also allow researchers to control how deeply an intense X-ray pulse penetrates into a sample. Berrah's team bombarded puffs of nitrogen gas with laser pulses that ranged in duration from about four femtoseconds, or quadrillionths of a second, to 280 femtoseconds. No matter how short or long it was, though, each pulse contained the same amount of energy in the form of X-ray light; so you might expect that they would have roughly the same effects on the nitrogen molecules. But to the team's surprise, that was not the case, Hoener said. The long pulses stripped every single electron from the nitrogen molecules, starting with the ones closest to the nucleus; the short ones stripped off only some of them. Their report attributes this to the "frustrated absorption effect": Since the molecule's electrons are preferentially stripped from the innermost shells, there is simply not enough time during a short pulse for the molecule's outermost electrons to refill the innermost shells and get kicked out in turn. With all this activity going on inside the atom, scientists have a new way to explore atomic structure and dynamics. Further experiments have investigated nanoclusters of atoms, protein nanocrystals and even individual viruses, with results expected to be published in coming months.